So, that's what I posted at Google+ and here I'd like to contextualize that some more: this is a colossal lost opportunity for my school, and a salutary warning for other schools that are pouring millions of dollars along with other precious resources into closed LMS platforms. Visiting GaryEngland.ou.edu. When you arrive at the site, you are first prompted to "log in or create an account." The account referred to there is a Janux/NextThought account. Janux is the OU-branded installation of NextThought, an Oklahoma-based LMS start-up in which we have invested millions of dollars (literally) over the past few years. About Janux. And just what is Janux? 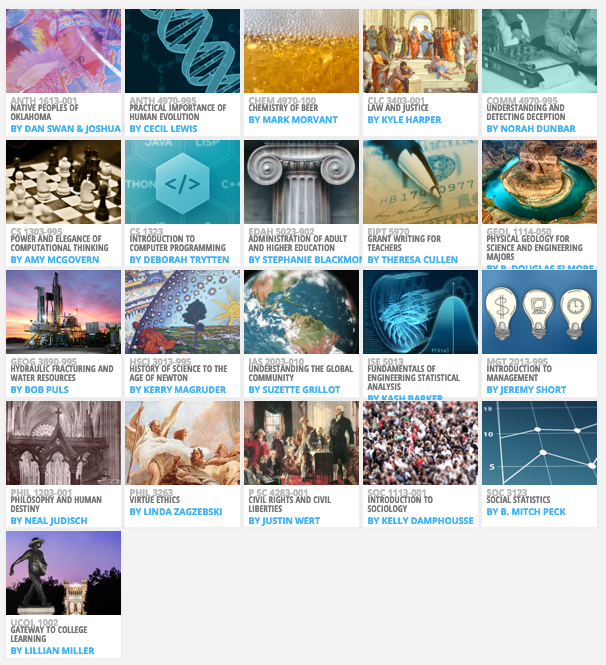 Well, according to our marketing people: "Janux is the first of its kind in OpenCourseWare, combining multimedia-rich content with interactive social tools and a broader learning community to create an unparalleled learning environment" (source). I've written extensively at this blog and elsewhere about the gap between that hype and the reality. I'm not really sure what is up with the Open (OpenCourseWare) claim; the content at Janux is not "available for use and adaptation under an open license, such as certain Creative Commons licenses," although some of the videos are offered at YouTube; see below. 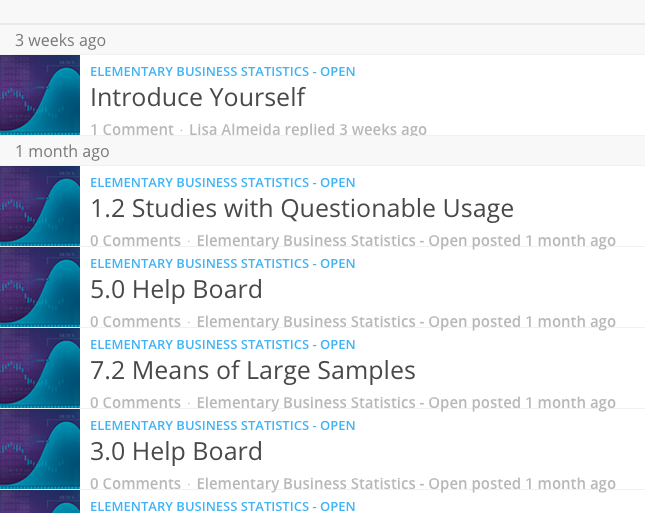 When it first debuted a couple of years ago, Janux was being promoted as our open learning platform; now, though, you don't hear much about the open courses anymore, which is no surprise, as the open courses seem to each fizzle into non-existence (the Beer course apparently being the one exception: it fizzes instead of fizzling, fueled as it is by a real community of brewers and fans of beer, although that course is not being offered right now). Instead of supporting open courses, the Janux platform is now apparently being used primarily for our HistoryChannel course ($449 for credit, undercutting the History department's own offerings; $149 for fun), along with some new online degree programs. None of that is open or free. What on earth was could be the point of keeping all that content locked up so that it cannot be accessed by a search engine? Open platforms make it possible for people to discover and use educational content: search engines index the content, web addresses make it possible to link to the content. None of that is possible with Janux. 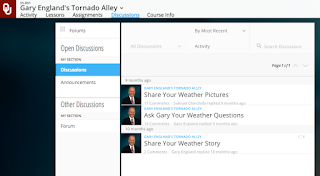 So now I have to ask: what is the point of paying millions of dollars for an LMS if what we are providing is educational content that people are ultimately going to access via YouTube and not through the LMS at all? 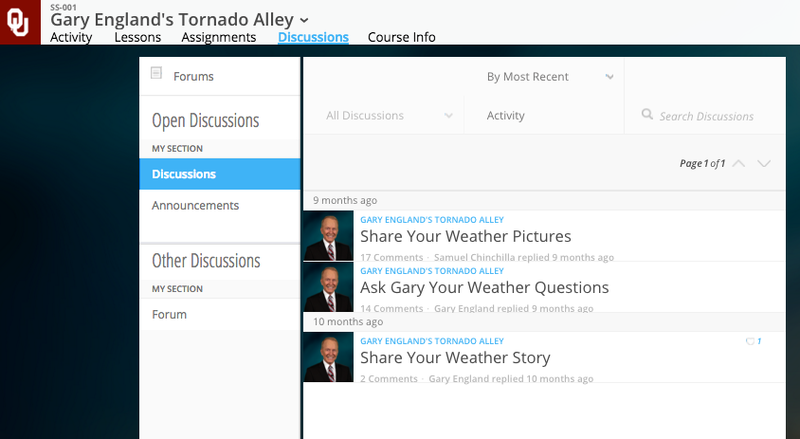 And why did anyone ever think it was a good idea to build an educational weather website inside this LMS when the goal was to reach as wide a public as possible? 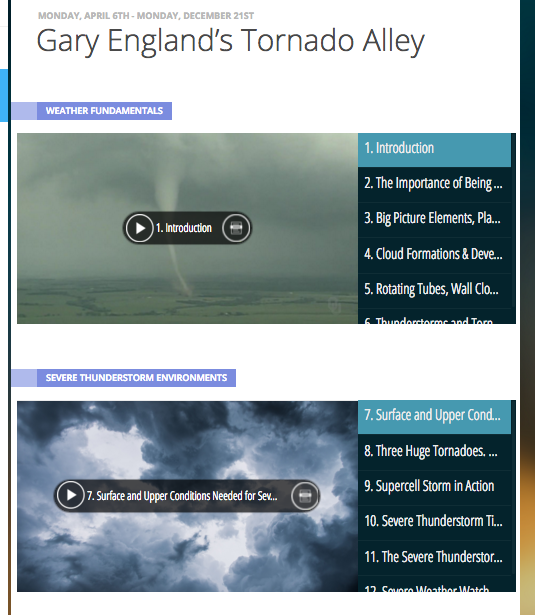 Tornado Alley 2015. 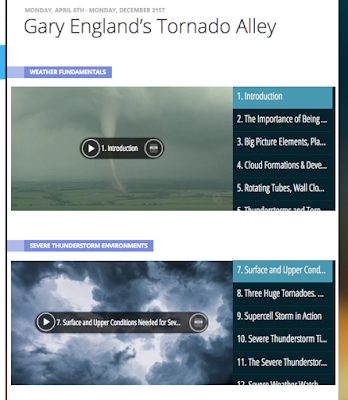 There was a big (BIG) marketing blitz when the Tornado Alley Janux site was launched in 2015. But how many of the people tweeting the self-congratulatory hype when the site launched actually logged on and participated at Janux? Almost nobody. There was far more talking about the course at Twitter than ever happened in the course itself. So, what have we got? Videos... in which case I'd far rather watch them at YouTube where I can save them and share them, and I don't have to log in if I don't want to. 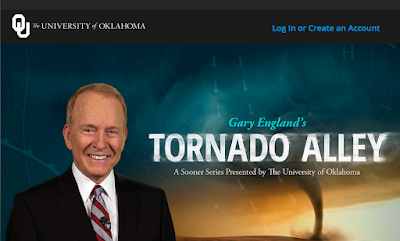 Tornado Alley Redux: February 2016. 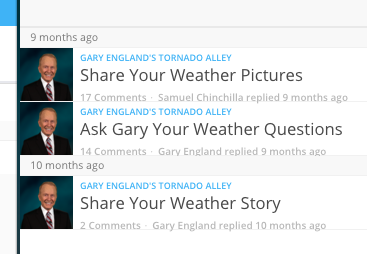 Yet Tornado Alley is back again, showing up unexpectedly at Twitter and in the Marketing Group blog post which I read today. And since this is a marketing thing, I have to wonder what the marketing people really think about this. If they want people to actually participate in the "course" (what do we call this Janux thing exactly...? ), they have a hard task ahead of them. Whatever was tried last time around clearly did not work. Are they going to do anything differently? Or will it just be another marketing blitz at Twitter and elsewhere, without anyone caring one way or the other whether people actually go to the Janux site...? P.S. Statistics Meanwhile, since I'm logged on to Janux right now, I'll check on that open Statistics course that I enrolled in as a test this semester to see if it is still completely moribund as it was when I last checked. And yep, it's flatlining.